The following Successful Promotions article is a great example of one company’s “Green” Effort using Earth Friendly items. When you have a name like the Earth Friendly Distilling Company (EFDC), you’d better back it up. To promote its 360 Vodka, the distiller believes it has done just that. Not only does EFDC donate $1 to environmental charities when a 360 Vodka swing-top closure is returned for recycling, but each of its 1.75 liter bottles comes with a reusable metal handle. The handle helps create a steady pour that reduces spillage and breakage. What’s more, the vodka is produced using machines that run on bio-diesel fuel, and recycled materials are used for its glass bottle and paper label. 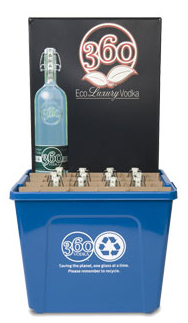 To hammer its sustainability message home, EFDC shipped 10,000 cases of 360 Vodka with logoed, reusable recycling bins sized to hold 12 bottles each. The company hopes that the blue bins will be used again and again for recycling efforts. It views them as a superior alternative to the boxes that wholesalers often provide to their customers for carrying home their bottles. Earth Friendly believes it has not only lived up to its name, but it has also set a higher standard for sustainability in the spirits industry. Are you making a “Green” effort? Reduce your carbon foot print with eco-friendly promotions. Source: Successful Promotions. “Eco-Friendly Charity Campaign”. Volume 39, June 17, 2009.